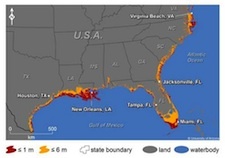 Sea Level Rise a Threat to 180 Cities in the U.S.
Miami, New Orleans, and Virginia Beach are just three of the 180 coastal cities in the United States that could be threatened with sea level rise by the end of the century, reports a new study published last week in the journal Climate Change Letters. Previous research has looked at where ocean waters may be headed as land-based ice melts in response to the warming climate, but this latest study focuses on the impact of sea level rise in U.S. municipalities of 50,000 or more and located in the 48 contiguous states. The study’s author, Jeremy Weiss of the University of Arizona, says his research used data from the US Geological Survey to calculate precisely how much land would be lost to rising seas. In total, nine percent of land, on average, could be lost in 180 U.S. cities, with Miami, Tampa, New Orleans, and Virginia Beach taking the brunt, with over 10 percent of their land lost to ocean waters. Areas like Miami are largely flat, making it more vulnerable to encroaching waters. Other cities like San Francisco (most definitely not flat), New York, and Washington D.C. face impacts, but to a lesser degree than the southeastern seaboard and Gulf coast, according to the research. Sea level rise from climate change will range from soil erosion to total and permanent inundation, says Weiss. The amount of damage depends on where the city is located; one reason why it will “come from all directions” for places like Miami. The Intergovernmental Panel on Climate Change (IPCC) estimates roughly a 3.6 degree Fahrenheit increase in global temperature through the end of the century. Weiss explains that his research projections are based on a “business as usual” approach. Given the current trajectory of carbon emissions, combined with no effective international treaty for limiting those emissions is in the offing anytime soon, an increase of 8 degrees F (4.4 degrees Celsius) reflects where we are headed. If we want to save Miami, we should get started now.